A topping out ceremony has been held at the new £500,000 home for people living with dementia and their families in Burton Leonard, near Harrogate. 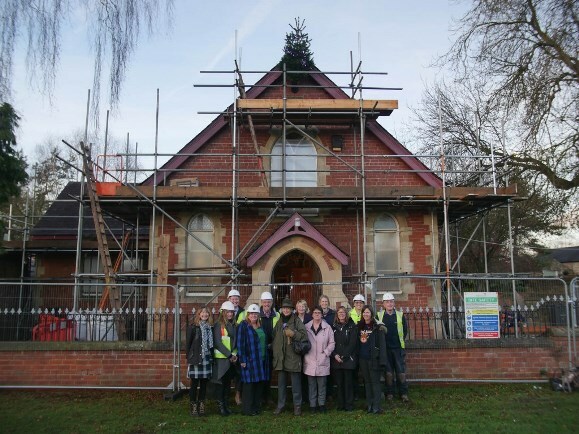 George Armitage House will be a hub for people living with dementia and their family and carers, which will provide resources and support for those dealing with the difficult disease. The charity behind the new house, Dementia Forward, was formed in April 2012 and is a vital source of information, advice and support in Yorkshire. It currently supports over 1200 families at any given time. The ethos of Dementia Forward is about ‘living well’ with dementia and is based on ‘local for local’; working closely within the community to provide advice, support and information whilst raising awareness and providing education on dementia. This ground-breaking new home is the brainchild of Dementia Forward CEO Jill Quinn and Valerie Armitage. After the two were introduced, Jill’s plans for a hub met Valerie’s idea of a house for people with dementia to use and very quickly they combined their plans and started the search for a suitable building. Valerie’s late husband George had run a charitable trust and she was looking for a special project to use the funds on. They found the perfect venue in The Chapel in Burton Leonard. The Chapel will provide much needed support in terms of activities, day service, groups and wellbeing sessions. It will also house the Dementia Support Advisors, who currently squeeze into one small room in Community House Ripon. Jill Quinn said: “We are very excited about the project, which we hope will be complete and ready for opening in April 2017. We have talked about such a place for years and the timing is perfect. “When we started out nearly five years ago we were a very small team supporting about 200 families by the end of our first year, but now we support six times that amount and the need continues to grow. “Supporting people to maintain wellbeing is very important to us not just for the person diagnosed, but for their families as well and this new resource will help us to provide much more of this. Valerie Armitage said: “I am delighted that all our patience and planning has come to fruition. My vision was that people affected by dementia would have somewhere to go and meet other people and that their carers would be able to have some time for themselves to do what they want to do. So many of us are affected and it is important that we provide a place for people to turn.